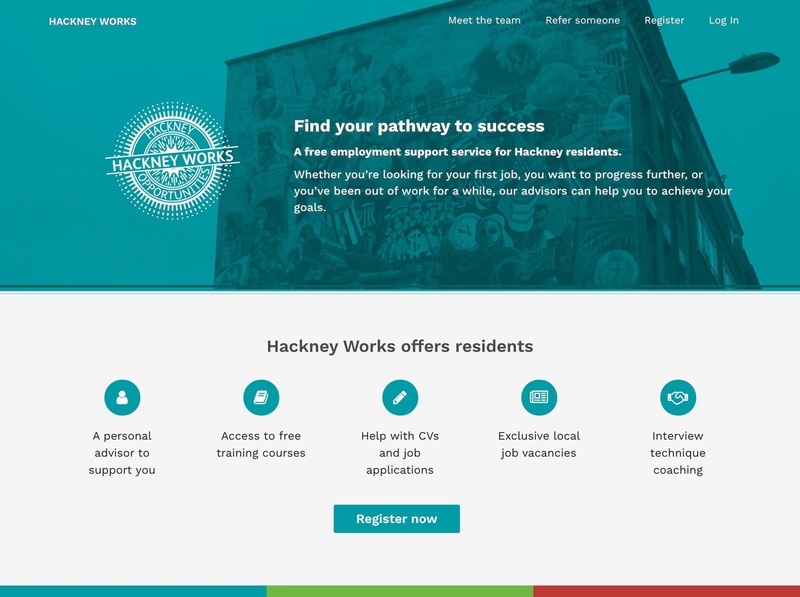 Hackney Works is a free service available to all Hackney residents, with three hubs spread around Hackney and around 20 job advisors. They work to helping people find work become more employable. The initial goal of Hackney Works was to increase their client base and efficiency, they came to us with the initial proposal of doing this through building a jobs board website to display the jobs they had active. Through our discovery phase and working with their service we found that connecting their job advisors with people who need the help was the most important part of their offer. However their time was wasted due to the system (or lack of system) they used. Hackney Works was an entirely paper based service (baring a few spreadsheets), with clients having to fill in a 12 page form on arrival and all planning and work done with the client being done on paper. this caused severely poor tracking ability of the users across the three hubs, with some people being signed up in the long process multiple times. This paper based system also caused many more hours of admin time for the advisors, and overall frustrated both the advisors and their clients. We proposed to both streamline their service and make it digital from the ground up. 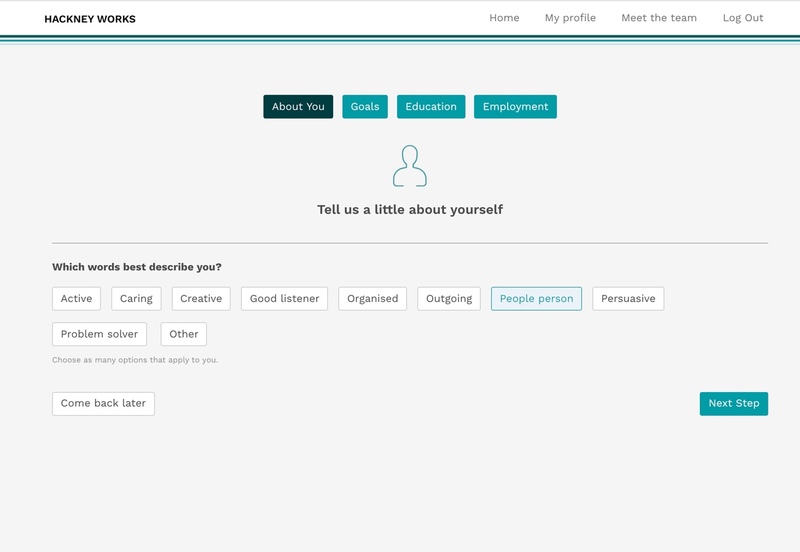 In our first phase we started with a single problem - the onboarding. Working with the team we helped them strip back and simplify their onboarding focusing on the minimum data they would need for a new client, to ensure a simple and user friendly experience. 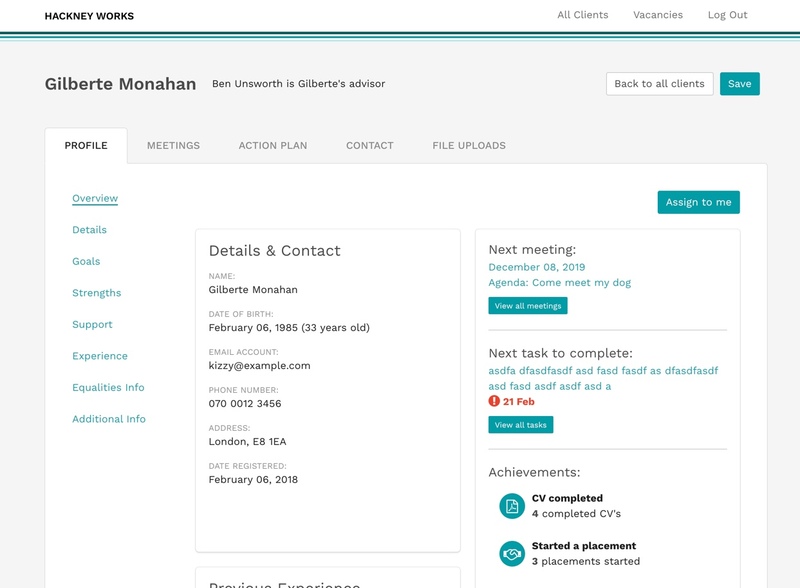 After testing and iterating this with them, their team and their clients, we began tackling other features that were important such as meeting booking and task management. The first phase of work was so successful and transformative for their team that the hub we had been working primarily with dropped all their paper processes and started using the MVP (despite it still being hosted on Heroku). We were brought in for another two phases, to further develop the prototype and to bring it into all three hubs. Our main goal throughout was to save as much of the advisors and clients time. The USP of the Hackney Works service is the advisors skills in working with their clients and their connection with the people they work with. The service is now entirely live in Hackney. Though streamlining admin time and reducing the silos that they work in we have managed to increase their capability in working with more clients and in spending more quality time with each client and high levels of satisfaction in both the clients and the advisors.